As I was working on this quilt my little guy looked at the quilt and asked me if the diamonds were broken. Ever since our little conversation this quilt has been "Broken Diamonds" to me. My original inspiration for this quilt came from this art print I pinned ages ago. I immediately saw a quilt in that art piece and thought it would be perfect for log cabins--you could just make log cabins and slice them in half. I then decided I didn't want any repeats in the design so I took large squares of paper and quartered them on the diagonal, then paper pieced each quarter triangle of the squares. Paper piecing gave me the precision I was looking for. I quilted this in a spiral--something I've wanted to do again since using this method on my Pixelated Color Wheel Quilt. I simply started sewing in the center of one diamond and went around and around until I reached the edges. I used the edge of my walking foot as my guide. My lines are approximately 1/2" apart. Originally I planned to add a couple more spirals of quilting starting in other diamonds, but this quilting was quite rough on my shoulder--especially when the diamonds were small and I was moving the entire quilt through the machine throat as I went around. I love how the quilting turned out, but I probably won't be doing it again for a while on a larger quilt. I love the back! I started pulling long scraps from my box and pieced them into strips. Then I just sewed all the strips together. I did this completely random, not caring where colors fell. I really like the result, and it used up a huge chunk of scraps. This quilt finished at 60" x 65". Originally it was meant to be larger with lots of white space. 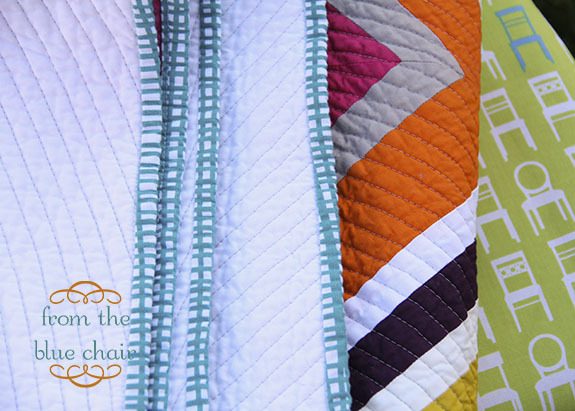 As I quilted, it just felt like too much white space and I started cutting. The white background is Kona white. The colored solids are all from the Art Gallery Pure Elements line. The binding is is from Lotta Jansdotter's line Bella. I think this print is perfect for bindings. I bought a yard of it recently just for this purpose. You can get it here. On a side note: I know I mention Art Gallery solids quite a bit, but I love working with them. I do wish they had more colors, but I'm sure more will come as they expand. The hand is wonderful on these fabrics, and they wash up great. The colors are deeply saturated and do not seem to fad after multiple washings. Art Gallery does not pay me to promote their solids, although I sure wouldn't turn it down if a big box of Pure Elements showed up on my doorstep. I have received some fabric from Art Gallery on a couple occasions for specific projects. I have seen discussions recently regarding bloggers disclosing info when they receive/promote free products. Although I don't necessarily agree with everything I've seen written on the subject, I agree that disclosure of this kind of info is important. I do promote products/fabrics on my blog, but I try very carefully to promote only those things I truly love. If I don't like something for whatever reason, I try to mention that in a gentle way. I have ventured into offering spots for sponsorship on my blog to support my fabric habit. This makes both me and the husband happier--I get some spending money for fabric, and I'm not draining the bank account. I am very dedicated to allowing sponsorship only from shops I love that have an inventory that fits my sewing style and taste. If I say I love a specific fabric line or shop, it's because I really do. I love your quilt Kati! Your style is always refreshing! Simply stunning, Kati. 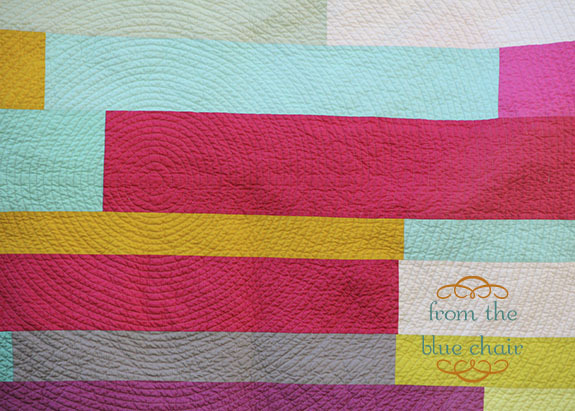 I love seeing the transformation from your inspiration pin to the quilt! I love this quilt so much, Kati! 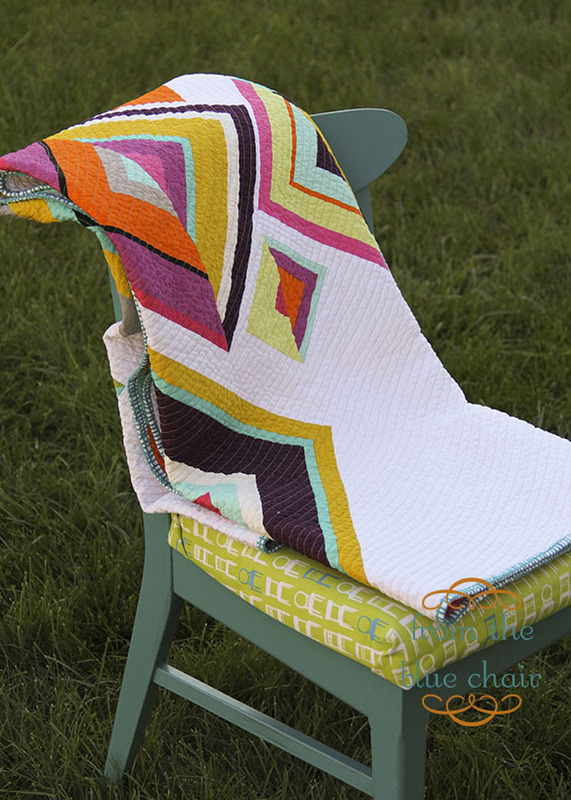 Everything about it is just right... color, design, quilting...all of it! Well done! The colors, layout, technique, quilting, everything. Love it all! You make me want to be better! Love, love Broken Diamonds! You rock! Fantastic quilt and well written blog post...on all subject matters! Very, very beautiful. Great back too. And I love the quilting. I've tried that spiral before and it is quite tricky to not get puckers and twirls . . . you did awesome! Gorgeous Kati. The spiral quilting is really the icing on the cake. 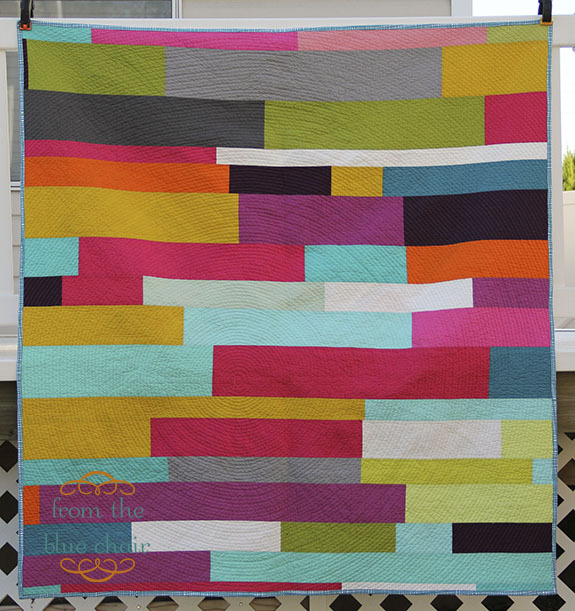 This quilt is just incredible, and the backing is wonderful, too. Love, love it! LOVE that quilt Kati...its really really beautiful! Once again, the back is equally as wonderful as the front. I love them both! I'm also loving your Chicopee quilt. That is a pattern I'm dying to try. And I laughed (not at, but with you) about the Sewing Summit dreams. I am still having weird SS dreams and I'm not even teaching this year! Love your quilt - front, back and name!! I like your interpretation of your inspiration pin and your quilting -wow I can feel the pain in my shoulders and back just thinking about it but the quilt looks beautiful so I'm sure it was worth it. Thanks for the inspiration. Love this Kati! 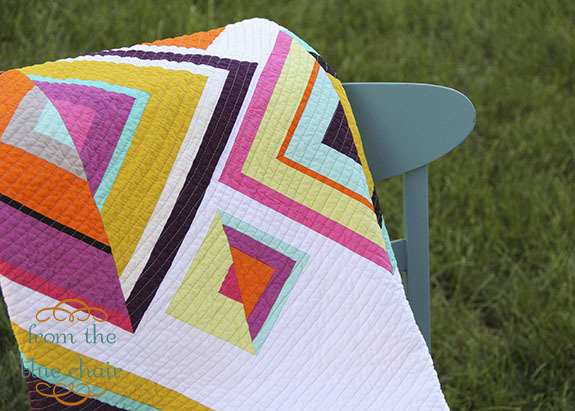 The layout is great, and the quilting is just the icing on the cake! Love love love! Such a lovely quilt, Kati! The quilting is perfect, and I too like those LJ sketchy prints for quilt binding -- such a fun frame on the project! It looks superb, I circular quilted an even bigger quilt earlier this year on my little Janome, it nearly killed me, but it is awesome and this week have taken delivery of a machine with a much bigger throat - now all I need is a quilt to quilt! I like the quilting on this quilt. It is a wonderful quilt. It looks like a picture its very pretty. Great work. I love both sides of this quilt! Well done, it's great! This is a really special quilt. The spiral design was worth it! I love it so much Kati! Are you going to bring it to the Sewing Summit to show off? Pretty please?? This is the most gorgeous quilt I've seen in a while! I love the colors and the design and the EVERYTHING!! I love the quilt!! I think the concentric circle quilting is a nice compliment to the square blocks. Great job! WOW! This is a beautiful quilt! Great job! It turned out just stunning Kati! You should be very proud! This is very fun to look at. I really like the name and the reason for the name. 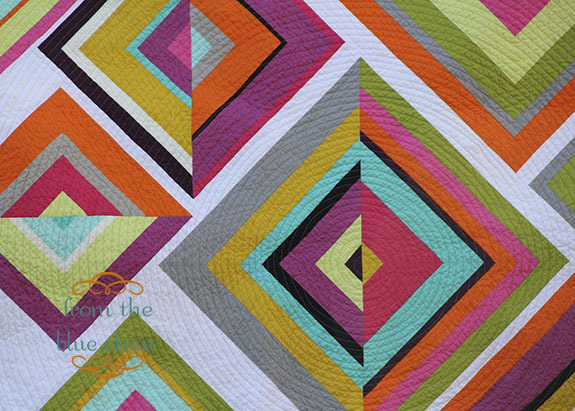 The curves in the quilting complement the sharpness of the diamonds so well. And the back is like a bonus quilt. Well done! This quilt is stunning! I love it, the broken diamond, the quilting, the colours you used, all of it. Stunning - love the beautiful colours and the quilting! The back is indeed a "bonus" quilt! This totally rocks - you definitely landed on the exact right amount of white. And yes, you are indeed a total class act, Kati. I appreciate your take on the sponsorship issue. If I'm ever in the position for sponsors (I'm a ways away from that) I would feel the same way. I love this quilt! It is so amazing! It's gorgeous Kati and I think you left just the right amount of white. The quilting looks perfect! Love this quilt! The front and back are equally awesome!! I love how you came up with the name of the quilt. So cute! As always, amazing quilt! Amazing! The back is just as great as the front! I just love the front and the back too. The quilting is amazing. at first I thought you had appliquéd your logo in the corner when I saw the picture - it actually looks rather at home there! You did a great job as always. I like the spiral too! I love the broken diamonds and the quilting is so beautiful, too. Love the quilt, the quilting, everything. I'm also in love with Art Gallery solids and hope they come out with more colors in future as well. Oh great quilt. I'm not sure if I like the front or the back more! Oh wow, I love this, both front and back, glorious mix of colours! This is amazing!! Love everything about it!! Sooooo gorgeous. Love it, Kati! This is so beautiful. Fantastic job with the quilting! It's just stunning Katy - you are such an original and inspirational quilter. I love that. Absolutely gorgeous!!! Wow - I have a little file of paintings that I'd like to translate into quilts one day. You've done an amazing job! LOVE!! Your quilt is fabulous! I must try quilting like this; it creates the neatest effect. What a superb quilt. Love the quilting too, I use circular quilting a lot myself. This looks great, Kati! I love it! I can see why you started cutting--that is a lot of circles!! So beautiful!!! I love the concentric circle too!! WOW. I love the front to pieces, but the back is divine. You have an amazing quilt there! Love the front and back...also the quilting lines. WOW! I wanted you to know that I gave you lots of credit all the way along! 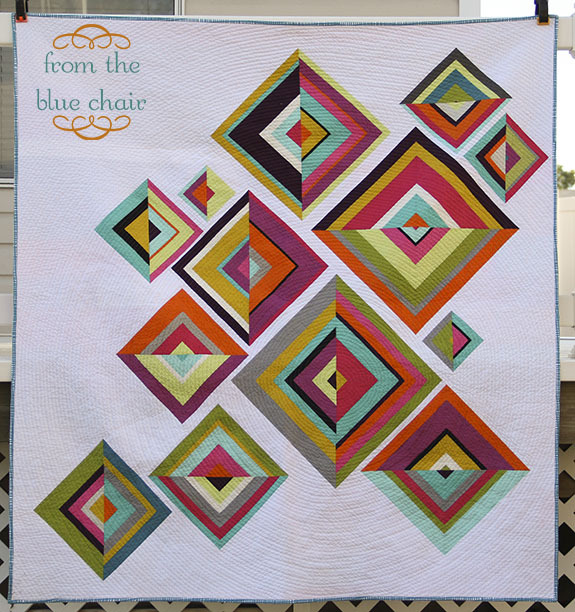 I just found my way here from a blog about all the winning quilts at quilt con. This one really draws me to it, and I am really inspired to learn how to produce something even 10% as beautiful as this. I'm totally intrigued by how you did it, and determined by the end of the year to try and figure out how to change my now obviously simplistic style into something so much more beautiful. I think I will definitely be becoming a regular reader!! Thank you for sharing your striking creation. I used the word striking because your creativity and work in this quilt made a strong impact on me. You have inspired my own work and discovery with solids. You brought me back to piecing on paper the way my grandmother taught me at age eight. I hope you don't mind that I have started my own interpretation of your lovely work. Your idea and quilt was inspiration to keep my hands busy through a long, lonely winter. Thank you for generously sharing your work with us!